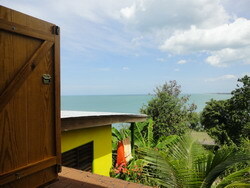 When you get your first look at Pon de Rock Oceanfront Cottages, you'll see exactly why they have that name. The colourful, whimsical cottages are crafted skilfully into the limestone rock that fringes much of Jamaica's south coast. This place has obviously been conceived with imagination and a sense of fun! My first visit had me wanting to explore every inch of the property. Call me nosey (not so loud please), but I couldn't help wanting to see how Rosi and Uli Schrag (the owners) used the natural rock formations to create a comfortable home for themselves and an inviting place for their visitors. Pon de Rock isn't a large property, but it has so many nooks and crannies that you keep making new discoveries as you feel your way around. Butterflies and a bird or two kept my company as I explored. Pon de Rock got started in 2004, as a place for Rosi and Uli to get away from the cold and the bustle of their lives in Germany. It started with the construction of the Blue House (I hope they don't get tired of the colour blue - can you imagine the identity crisis The Blue House would have if suddenly it was painted orange?!). Anyhow, I stray from the point. The Blue House is a studio cottage, with a split king-sized bed. There is a kitchenette with a fridge, a stove and cooking utensils. You have a choice of using the outside shower (here comes the sun!) attached to the house, or the bathroom inside. The Yellow house came a bit later, designed by the family, and built with the help of many willing hands in the area. 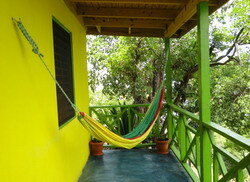 The Yellow House gives you two choices of accomodation - Flo's, and The Balcony Studio. These two apartments share an outside shower, but have separate indoor bathroom and kitchen facilities. Flo's Kitchen Bar is an ingenious fusion of bar and kitchen facilities in a quirky colourful space. Flo's has a queen sized bed and an additional single bed, The Balcony Studio has a queen size. There's lots of colour everywhere, but what really grabbed my attention was the polished blue concrete floor. Beautiful! The cottages are in Fort Charles, which is at the far west side of the string of bays known collectively as Treasure Beach. It's one of the further properties on that side, so having a scooter (easy to rent in the area) or a car will be very convenient for your stay. The views of the ocean are stunning, and the beach is closeby. Five minutes walk will get you to what the Schrag's call the ""Small Beach", and 15 minutes will take you to the more well known Fort Charles Beach. Don't go looking for a wild night life here - this place is about easing the tension and breathing fresh air. If you'd rather not do any cooking, you can make arrangements for the housekeeper to come in and prepare meals, or you can venture a few mintues east into Billy's Bay, Frenchman or Calabash Bay which have many restaurants for you to choose from.